The MoVeS Knee Rope Pulley helps increase range of knee motion. As a result, the Knee Pulley is a very effective product to prevent knee injuries or to help recover from an injury. Because of its door anchor , this easy-to-use device can be mounted in any doorway. While sitting on a chair, fit your foot into the ankle strap. 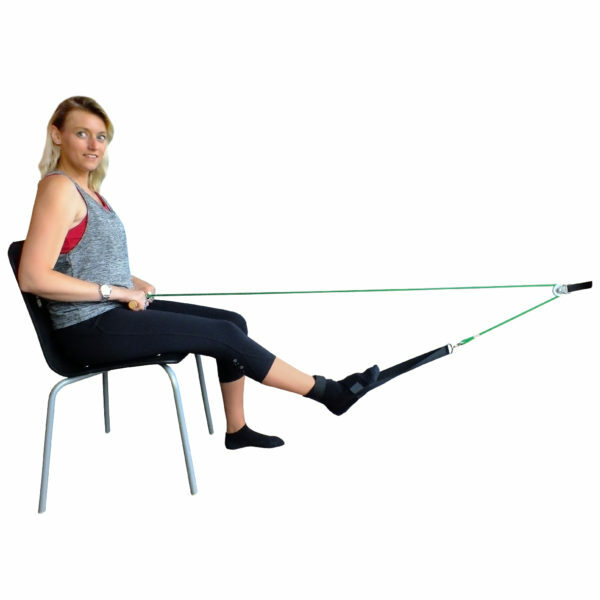 Pulling the handle which will generate a rotational movement at your knee, improving range of motion. A print on the ankle strap helps you to secure your foot in the right position. Finally, the rope length is easily adjustable at the handle. A Shoulder Rope Pulley is also available. Find our complete range of MoVeS products here.